First, gel foam is somewhat of a misleading name. It is actually really memory foam that is infused with gel beads or liquid. There are some pure gel materials out there, and I’ve looked at a bunch of these too like Intelligel or the new Purple bed which uses a similar looking gel, but when you are talking about gel foam used in beds you are talking about gel infused memory foam. And there is a lot of hype about it since gel foam is the latest, greatest thing and this sort of hype drives a lot of sales. But is gel foam, somehow, preferable to memory foam? The hype is that it sleeps cooler than memory foam — and the claim is that this heat issue is a serious problem for those sleeping on memory foam. And while it may be true that gel foam sleeps cooler than less expensive, older generation memory foams, I found that the latest generation memory foam I used in my beds from 2010 – 2016 had vastly better air flow and we got almost no complaints about this type of memory foam sleeping hot. 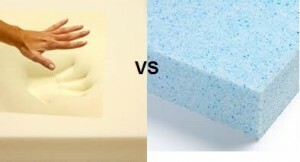 And … the pure memory foam we used had a much softer, more conforming feel than gel foams. So, based on the superior comfort and feel of pure memory foam, and that the latest generation of memory foams seems to have solved the issue with it sleeping hot, I never saw any reason to switch to gel foams which tended to be even more expensive than top of the line pure memory foams. But you don’t have to believe me. Let’s go to the real world data I accumulated over the years of selling mattresses using this latest generation memory foam to see what light it sheds on these issues of whether this type of memory foam sleeps hot and what sort of ratings it got from our customers for comfort. First let’s look at comfort — the #1 concern of our customers, as well as my #1 focus. Our 10″ Memory Foam Mattress had earned the highest overall satisfaction rating from the independent mattress review site, SleepLikeTheDead, with an 86% satisfaction rating (to put this in perspective, memory foam overall gets an 81% satisfaction rating (the highest overall rating for any mattress type), and innersprings get a 64% satisfaction rating). SleepLikeTheDead doesn’t separately rate gel foam beds, but the leading brand Icomfort gets varied ratings for its different models, with most of the customer satisfaction ratings for these models in the 70’s%, with just a few in the 80’s%. So our stacked up well in these objective satisfaction ratings — and even better in our own customer reviews. In our own over 440+ customer reviews of our 10″ Memory Foam Mattress, 96% said they would recommend our mattress to a friend, and 95% rated it as comfortable. Given these amazing ratings and reviews for comfort, I just never saw any reason to switch from the pure memory foam we used to a gel infused foam for comfort. In fact, I think it is pretty clear we had a real edge in the comfort ratings for our bed using pure memory foam. So let’s look at the other reason sellers hype gel foam — that it sleeps cooler than memory foam. Here’s the specific data we have from our customers that shows that, at least as far as their real life experience on our 10″ Memory Foam Mattress, sleeping hot just isn’t a problem. First, I looked at our returns to see if this is a problem leading to returns. And only one in every 150 – 200 returns say that they are returning their mattress or topper because it slept hot. So this is something that we get very rarely. Which is pretty striking. 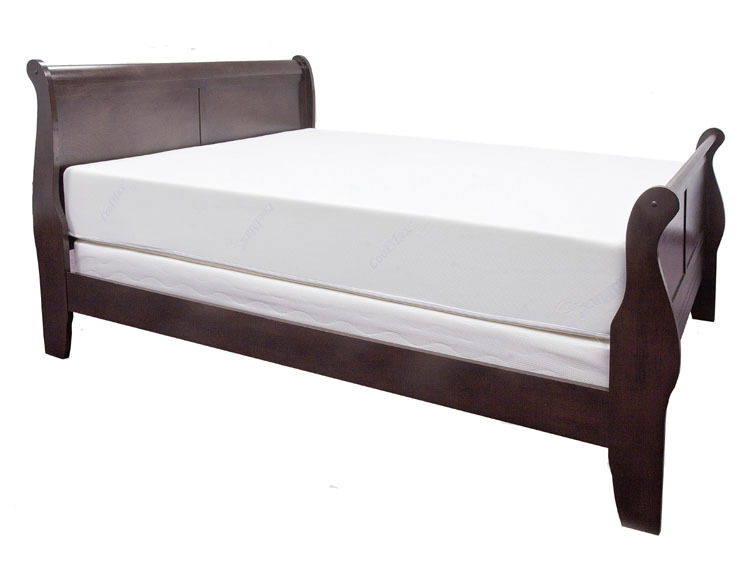 If sleeping hot was such an issue with memory foam, you would expect to see a lot more returns for this. If you believed the hype about memory foam sleeping hot, I would have expected perhaps 1/3 – 1/2 of our returns to be for this reason. But in reality, it is more like .4% — so vary rarely is this a reason for a return. Again, our experience may be different than other memory foam mattresses due to the special, expensive memory foam we use in all our mattresses and toppers. But I wanted to go deeper than just the return information, and luckily our customer reviews provide a data base of information that we can look at to try to objectively answer questions like this. And since I know sleeping hot on memory foam is a concern people have, I have asked customers to address this in their reviews — to let us know if it was a concern of theirs, and if so did it turn out to be a problem. And the results? Here is what we found: 68 of the 412 total Healthy Foundations 10” Memory Foam Mattress reviews we analyzed did mention a concern of whether it might sleep hot. Of these 68 reviews, 42 said that the Healthy Foundations 10” Memory Foam Mattress did not sleep hot, 13 said it was slightly warm at first, but that they adjusted or the warmth was not an issue, and 4 reviewers solved their own heat issues with a change in mattress covers or blankets. Nine reviewers said the mattress was warm or hot, resulting in two returns for this problem. Bottom line – Of 412 reviewers of the Healthy Foundations 10” Memory Foam Mattress we looked at, only 9, or 2.1%, said it slept hot, and only 2 — or less than 1% — returned it due to their feeling hot on the mattress. So while there is a lot of talk out there about memory foam sleeping hot, in our case based on our customers actual experience on our bed (and all are posting reviews after sleeping on our bed for at least 3 months), in reality the vast majority of reviewers simply didn’t find that sleeping hot was an issue. Comfort, along with durability, are what I shot for, not the latest and most hyped new shiny thing. So based on the great response we got from customers for comfort and the extremely low incidence of issues we had with people finding the mattress slept hot, I never saw any reason to switch over from pure memory foam to gel foam — especially when I saw that gel mattresses did get overall lower comfort ratings. I hope that this in-depth look at my experience with pure memory foams and the downsides of gel foam mattresses vs pure memory foam has been helpful and if you are ready to look at buying a memory foam mattress, I hope you will check out our other buying guides where I share more insider’s information and tips, based on my 20+ years selling memory foam, to make sure you get the right memory foam for you at the best possible price: Memory Foam Buying Guide: What It Is, Why It Works, And The 5 Key Things To Look For When Buying A Memory Foam Bed Or Topper, and our Memory Foam Mattress Buying Guide and Checklist.